Happy weekend everyone! I am looking forward to seeing everyone's critters this week..I appreciate everyone who has linked up in the past and for those who are linking in on this week's critter party. I am sharing some more of my Colorado critters.. I hope you enjoy them.. The Pine Siskins are cute birds and easy to id with the yellow on the side of their wings and tails. I was tickled that our hotel in Estes Park had a line of these pine trees with all the pine cones at the top. The birds were loving the seeds from the cones. I could stand on our balcony and just snap away at anything that moved..HAHA. A female Red Crossbill was a lifer for me.. We walked ( I was birding) a few mornings at the Matthews-Reeser Bird Sanctuary in Estes Park. It was part of the trail that loops around the Estes Lake. The female cow elk and the bull elk seen on the parking lot at Estes Lake. A young elk or calf.. not too far from the adults.. I use my zoom lens on all photos. I am not getting close to or in the way of these wild animals. I would say this man is too close, but did he know what was behind him.. The people were checking out the females and some young elk on the other side of the car.. 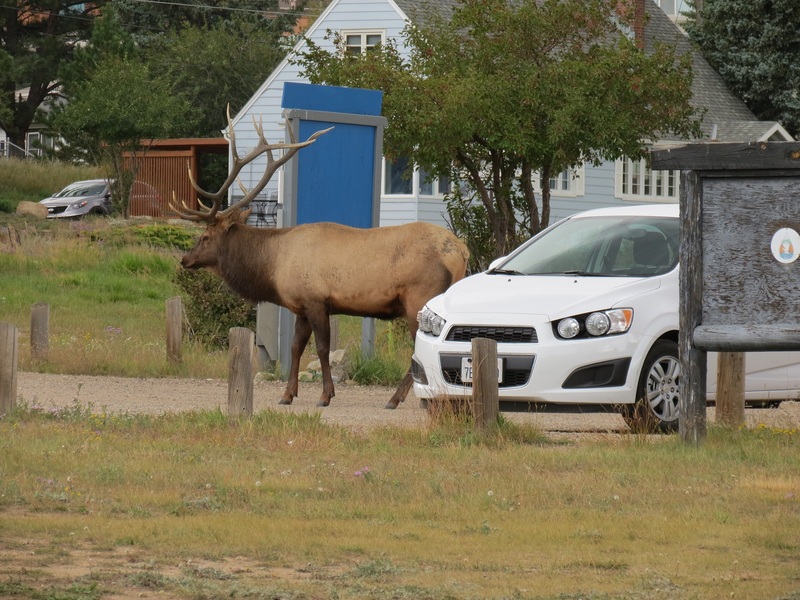 The white car is our rental car, hubby laughed at me because I would not walk back to the car until the Elk moved away. I was not getting close to him. I was told that this bird could be a lifer also, the female or juvenile Cassin's Finch. 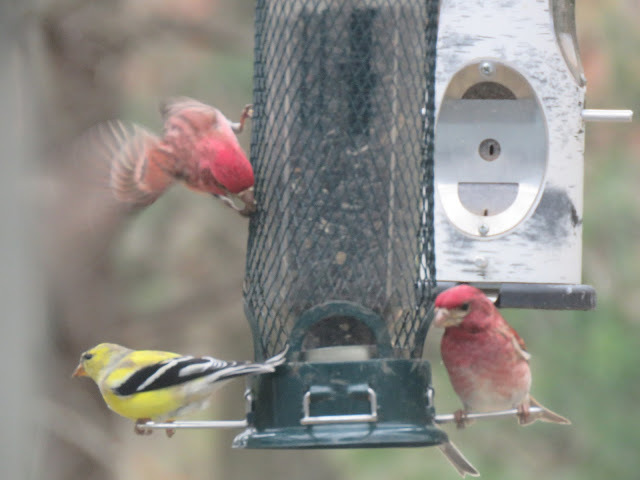 They have a forked tail and the male has the raspberry color like the Purple Finches. It can be confusing with the Cassins's Finch, Pine Siskin's and the square tipped tailed House Finches all being seen in the area. I may have some better photos of this bird, I have to look some more.. The elk are beautiful animals, but I wouldn't want to be too close to them either. Have a great weekend, Eileen! HI Eileen Managed to link myself in but thanks anyway. Loved your post and seeing the wonderful Elk. Have a great weekend and thanks for hosting. elk on the parking lot? That´s kind of weird. Don´t think it would happen over here unless one was strayed off. Witch happens maybe once a year. Great shots and you did right staying out ot the way. I would be waiting for that huge elk to move too before i went back to the car. The antlers look like they could do some damage. For once I have a critter post with which I can join the party. Eileen, your pictures are so great as always ! I admire shots of the elk and deer, and the courage of these people ! That is one humungous elk. I would wait till he moved away from my car too. 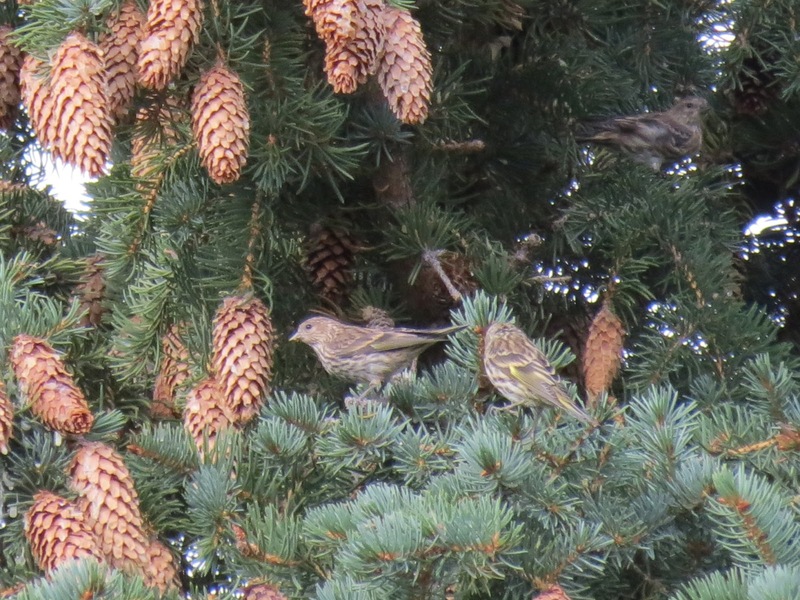 And the pine siskins are so cute. 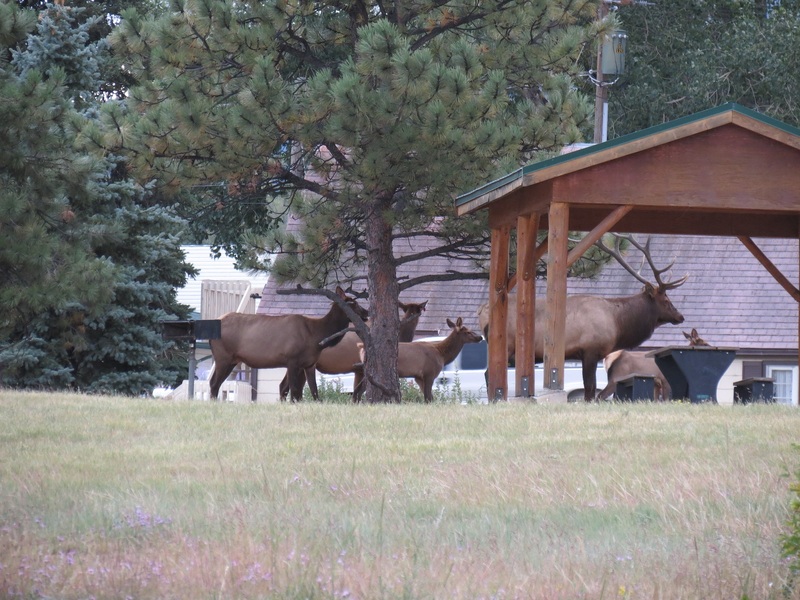 I can't imagine having elk in my garden, I wouldn't have the nerve to shoo them away. But can they jump over fences? Cool shots, and captures of the birds. Beautiful pictures, the moose are very close to the houses. Maybe they are hungry, the bears do this I hear. I think you were wise to wait for the elk to move away from your car. Even though they are in the parking lot, they are still wild animals, and large ones at that. You got some excellent photos, by the way. Fascinating to get as close to the animals! In Norway you can in cities far north meet reindeer in the street, but not here west of Bergen. Have a nice weekend! Woe, he is big boy, great photos. Wow.....these animals look strong and powerful....and very handsome.! The Siskins have plenty to eat right now in their beautiful cone laden pines. That was quite an event. Good thing you had your camera ready. love all the pine cones. i wonder why they were so plentiful on this tree? so curious. Do you think you could give me credit for creating your meme badge? I need the positive karma! the birds among the pinecones are just so pretty, these images remind me of what's coming!! the elk look big and powerful and oh so beautiful!! I see such animals only in documentaries... Fantastic to have the chance to watch them so close!! And the instant with the youngest is so precious!! lovely!! Thanks for sharing with us! Have a great weekend! 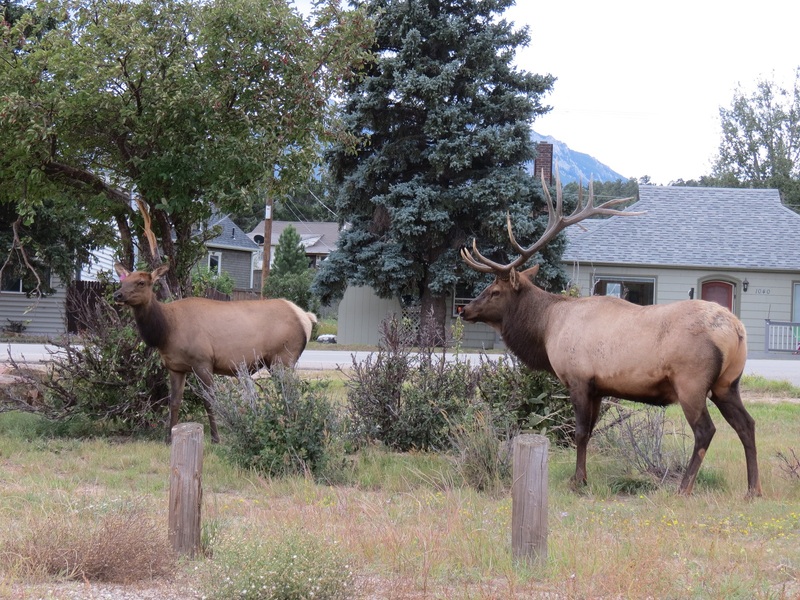 I have been to Estes Park and, like you, I would not get near the Elk!!! The elk are great, but hubby would be looking at hunting them. The male in that one picture is elegant. How awesome! What gorgeous animals! wow! those elk are beautiful! and those people are too close! sheesh! congrats on the crossbill! and thanks for hosting!!! You excite my memories of living in the mountains of New Mexico and my several stays at the YMCA in Estes Park. Look forward to more Colorado photos! Beautiful pictures of these strong animals! Have a nice weekend! I think you were smart not getting too close Eileen. Those elk can be unpredictable and move very fast when they want to. Gorgeous animals! Your pine siskins were lovely and how nice that your balcony gave you such a great view. Pretty pine cones also. A super collection of photos! Must have been a great trip. Happy weekend to you and thanks for hosting. What awesome close encounters you had! I am also never want to get close the monkeys over here. Crazy! Can't believe those big animals - gorgeous big animals - were so close to the human folk! Great shots! What a lovely post! !The Pine Siskins are so cute! !Wow,the elk looks so big and not friendly!Glad you used your zoom!! !Great shots! !I really enjoyed your photos!Have a happy weekend! Those are pretty impressive antlers on the bull elk! Great shots. I've never seen a pine tree with so many pine cones on it!! Bet the birds are just loving all those delicious pine nuts!! And bet they are fat little birdies!! I'm taking notes on your trip to Colorado!! When exactly were you there?? We have never been to Colorado and we may need to make the trip for next years Fall break!! I WANT TO SEE ELK!! Awesome shots!! Looks like we hit Estes Park on the wrong day, or went through there too fast. We stopped briefly at the Visitors Center and stood on the little bridge overlooking the stream, but we drove through town with our friends (they were so kindly showing us the sights) and didn't make any other stops. We were so anxious to see elk closer than a half mile away! :-) But it didn't happen for us then. I DO have some elk photos, but haven't found the right time to post them yet) Your photos are amazing!!! How we would have loved an encounter like this. 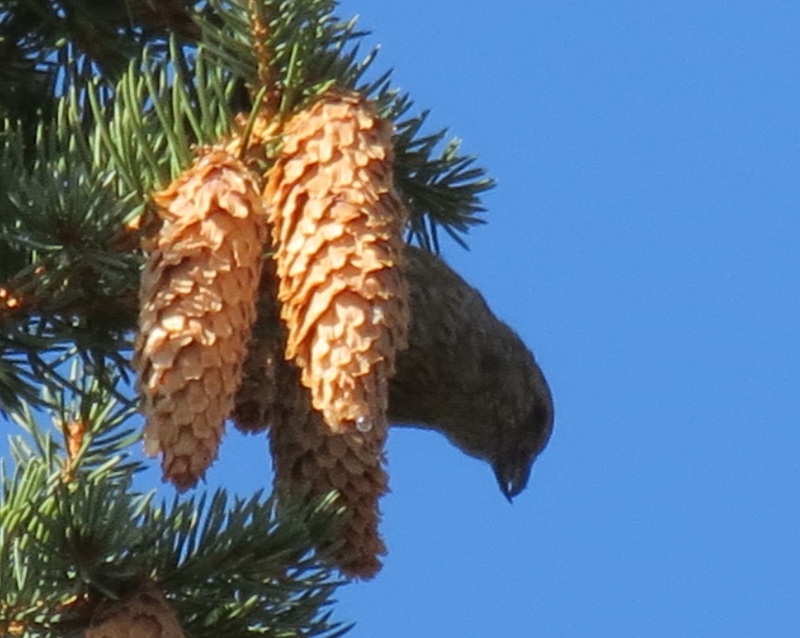 Love the pine cones and the siskin too. 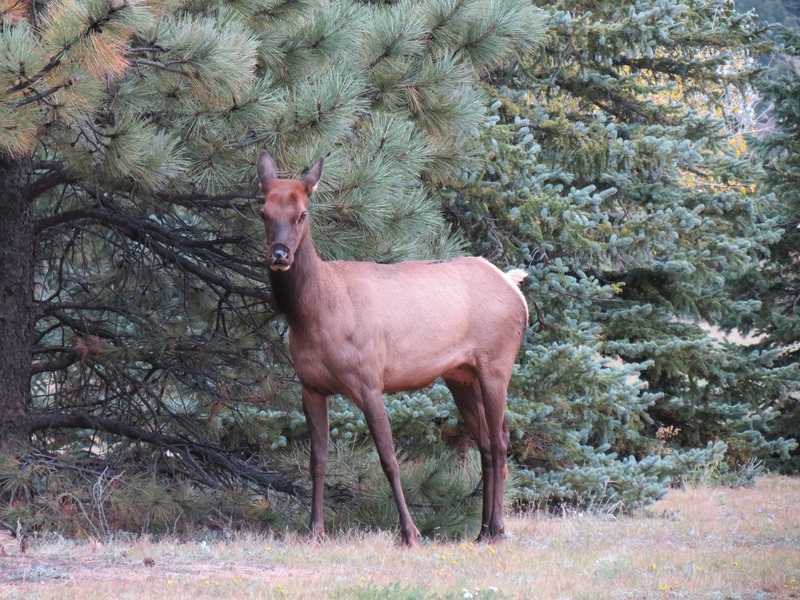 Beautiful shots of the elk! You were wise to steer clear of the males. During rutting season they are quite aggressive. Thank you for hosting the meme! Wonderful photos, as always, Eileen! I especially appreciate your reminder that we should avoid going too close to wildlife. Those long lenses are invaluable, aren't they? Had to smile at the fellow, though. I'm guessing he had no idea he was being observed so closely. Oh.. and congratulations on a lifer!! Congrats on your Red Crossbill. Oh, terrific shots of the elk. This reminds me of the time I was in Banff (Canada) and there were elf walking along the streets downtown! Great to see them so close, it is no fun to them so close and in the garden, our Red Deers eat everthing. What a great bunch of photos...I am with you on staying away from the elk. Not sure when their time of rut is, but I know deer is getting ready to start here. Beautiful animal shots, Eileen. Finally got in to link my blog here. Been a busy day so far. Have a good one! Wow...that is amazing! The whole family! Look at that rack...I wouldn't have gotten too close either! Beautiful, impressive animals! I like that you treat them with respect and give them space. I think you were smart to stay back from the elk and used your zoom. You got some great pictures of them. Love all those pine cones. There are lot of them on the trees in my yard. Yesterday a squirrel was knocking a bunch of them off the tree. Oh wow! What a sight to see Elk so close to houses and cars. Is this a common sight? Fun to see these elk! Very sensible Eileen! I'd love to be able to watch elk like that, thanks for sharing your images and experience. I love the way the birds' feathers mirror the cones, great camouflage. Good morning Eileen and thank you for hosting once again.I think you did right to keep a respectable disatnce from those huge Elk, especially since they have youngsters in tow. It's too late if they use those antlers on you. Can't help with the finch ID I'm afraid, maybe at your next post. Thanks for sharing your link today at I'd Rather B Birdin'!! Hi! 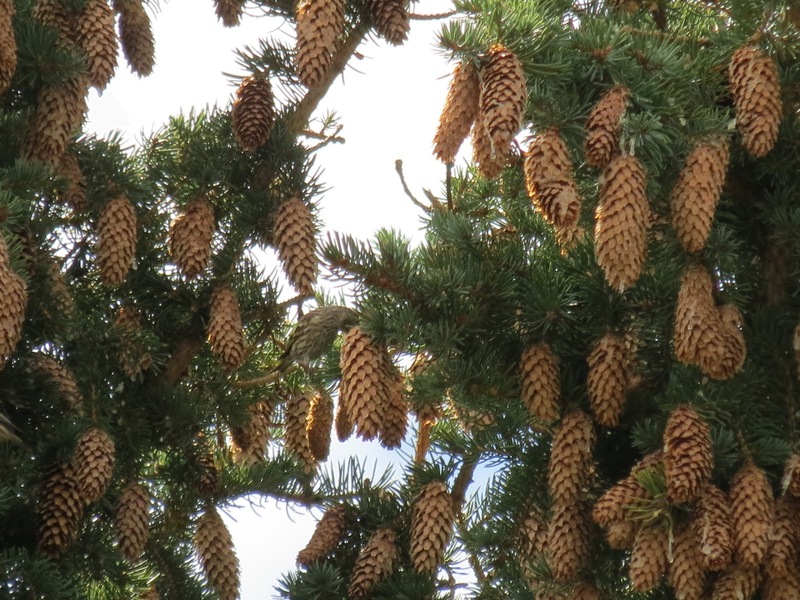 The bird among many pine tree cones is very impressive. I enjoyed your elk photos very much too. Thanks for sharing. Wishing you a wonderful Sunday. Pine Siskins are pretty much a winter species here, but if they irrupt then I have them on my feeders. I have my fingers crossed! The pine siskins are sweet eating the seeds from the cones. They're hard to tell from the goldfinches for me when not that close. As for the critters by your car - better to be safe than sorry. Great shots of the animals as they moved throughout the area. Very nice Eileen and the birds. The crossbill I hope someday to photograph but you Siskins are great to see. But the best thing is the moose! What about those nice sharp and clear up! The birds were interesting to see since I've never seen them before. I've got to say though that the Elk stole the show here. I'm with you on not getting to close. It amazes me how (dumb) people are getting that close to wild animals. 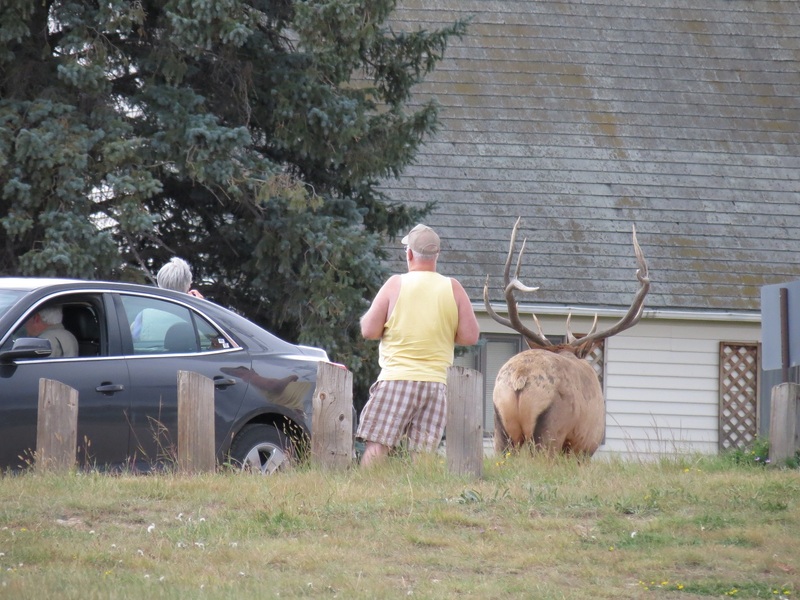 I've seen videos where people are being charged by Elk while trying to get photos. Not something I would care to try. I think this post is beautiful, I know the people may have gotten too close, but the elk seemed tranquil and it all looked harmonious. I'm glad places like these exist. Amish and Kitties and Quilts!